Your house is likely to be the biggest investment you make in your entire life. Whether you're planning to sell it or you're there for the long haul, it is important to take care of your investment. As any real estate agent will tell you, the first thing people notice about your home is the exterior. You need strong curb appeal to make a good first impression. Landscaping is often regarded as one of the top three ways to add value to your home in terms of return on investment. HomeGain.com conducted a survey of 2,000 brokers in 2007. The results indicated you could possibly quadruple an investment of $400-$500 on well-planned landscaping. That said, just throwing a couple hundred dollars at plants is not a good approach. Instead, focus on creating a healthy, vibrant lawn. Fill in dead or sparse areas, fertilize, and clean up edges along your sidewalk, pathways and gardens. Trim overgrown bushes and shrubberies and cut down tangled tree branches. Plant flowers and plants to brighten up your landscape—just be sure to plant perennials that will come back year after year, not annuals that will die within a year and never return. Also, look for plants that are native to your region or are drought-tolerant. They need less water and maintenance, saving you money in the long run. Your front door is the entryway to your home and it sets the tone for the rest of the house. Make a good impression by ensuring your home's entry point (including the area directly surrounding the door) is attractive and eye-catching. The first thing to consider here is whether to replace your existing door or not. If the door you have is good quality and a style you like, you can save some money by just freshening it up a bit. Refinish the wood or paint it for a pop of color; clean and polish the hardware or replace it with something that will add more of an accent; and replace the hinges if they are worn. If you decide to replace the door, look for a well-insulated, energy-efficient, secure door; this is not something you want to cut corners on by going with a cheap alternative. Outdoor/exterior lighting adds value to your home in three important ways. First, it helps keep you and your family safe. It's important to be able to see where you are going to avoid a fall. Second, it adds a layer of security. Keeping your property well-lit is a good way to deter a would-be thief from targeting your home. Third, it enhances the aesthetics of your property. Show off your beautiful home and well-maintained landscape. Consider which of these aspects are important to you. If safety is your goal, focus on pathways, entryways and steps. If you are more concerned with security, perimeter lighting set on timers and motion-activated flood lights are your best bet. If you want to add curb appeal, light up your trees, unique landscape elements, and water features. The second thing to consider is what type of lighting to go with. Solar is great because you don't need wiring and don't have to pay for power. LED lights produce a bright, crisp light and are energy-efficient. Halogen lighting, though affordable, is being phased out for the most part. Consider replacing existing halogen bulbs with LED replacements (also called LED retrofitting). You see your home every day, so you might not notice as it slowly gets dirty and the colors and features become dusty and dim. Just spending an afternoon with the power washer can dramatically add some pop and resuscitate your curb appeal. First and foremost, read the instructions and specifications of the pressure washer you purchased or rented. Check the water flow in gallons per minute in addition to the PSI, and get one with different pressure settings if possible. Confirm it is okay to use on all the areas you are planning to wash to ensure nothing will be damaged. You'll probably be okay on things like sidewalks and driveways, but double check that your siding and windows can withstand the pressure. Turn off power to electrical outlets and fixtures and cover them. You may also want to cover plants and flowers if they are close to your house or the area you'll be cleaning. You'll likely want to use detergent (only use detergent that is specifically made for pressure washers) for the grimier parts of the job. Adding a fire pit is a cheap, simple way to help get the most out of your outdoor space by breaking it up into different areas. Fire pits consistently poll well among potential homebuyers (especially younger ones), and came in first in expected popularity of design elements, according to the Residential Landscape Architecture Trends Survey. One of the great things about taking on this project is that it can be as simple or as grand as you like. You could DIY a very basic one for as little as $150, or you could go all out and include a gas line (with professional help) and a fancy fixture if you have a bigger budget at your disposal. If you are not as handy, you can get a kit with everything you need and step-by-step instructions. However, building your own fire pit is not overly complicated and will allow you to completely customize it to fit your personal taste. These days, homebuyers want the latest technology. It's easy to understand why when you look at all the amazing things technology can do for your household. Having these advanced features can be what sets your home apart from similar ones on the market. You can install smart locks for added safety and convenience. You'll never have to stumble around trying to get your keys out of your pocket while carrying groceries again, thanks to Bluetooth technology that will pick up on your phone approaching—and you'll never stress again wondering if you forgot to lock the door when you rushed out. Smart sprinklers can save time and money. The sprinkler system can adjust based on weather patterns and temperature so you’ll save money by not wasting water. These are all projects that offer a good return on your investment and can be done without a professional, saving you around 40-60 percent of what you might be charged. Plus, these projects can be wrapped up within a couple days, meaning you could conquer them over the course of a weekend or two. Get out there and start building some sweat equity the smart way! By many metrics, the housing market has overcome the worst effects of the housing bust. Nominal house prices have regained previous peaks, construction volumes are nearing their long-term averages, and household growth is becoming more balanced between the owner and renter markets. Home prices nationally appreciated 5.6 percent in 2016, resurrecting equity buried in the recession, the report shows—but, when adjusted for inflation, most homeowners have not yet fully realized wealth that was lost. Prices rose in 97 of the nation's 100 largest metropolitan markets, but prices in 32 of those markets have not beaten their prior peaks. Prices in areas on the East and West Coasts have made substantial strides, while prices in portions of the Midwest and South have fallen behind, contributing to an affordability divide—prices in the 10 metropolitan markets with the most appreciation, in fact, average $575,000, more than four times the average in the 10 markets with the least appreciation. Home-building, at the same time, netted 1.17 million units—up from 2015, but still down compared to activity in the 1980s and '90s. The building of single-family homes expanded by 9.4 percent, but the building of smaller single-family homes and townhouses, which are in severely short supply, fell—a trend that has persisted for the past decade. Building continues to be tamped down by regulatory burdens, scarce labor and shrinking available acreage. "While the recovery in home prices reflects a welcome pick-up in demand, it is also being driven by very tight supply," says Chris Herbert, managing director of the Joint Center for Housing Studies. "Any excess housing that may have been built during the boom years has been absorbed, and a stronger supply response is going to be needed to keep pace with demand—particularly for moderately-priced homes." Though fewer households are cost-burdened—or spending over 30 percent of their income on housing—many are still struggling, particularly renters, according to the report. Over the last five years, the share of cost-burdened owner households has seen a sharper decline than the share of cost-burdened renter households: 6.5 percent versus 1.9 percent. "The problem is most acute for renters," Herbert says. "More than 11 million renter households paid more than half of their incomes for housing in 2015, leaving little room to pay for life's other necessities." There is a brighter outlook for the homeownership rate, which could rebound if household formation pans out as predicted, the report reveals. Low-income, minority and renter households are expected to considerably contribute to growth, with affordability playing a major role, specifically, in renters making the transition to homeownership. Forty-five percent of renters can afford the costs for a median-priced home in their area, the report shows—in line with similar findings from a recent analysis that demonstrate renters can afford more than a median-priced home. "Although the homeownership rate did edge down again in 2016, the decline was the smallest in years," says Daniel McCue, senior research associate at the Joint Center. "We may be finding the bottom." Owner household formation is projected to increase 8.9 million between 2015 and 2025, according to the report, while renter household formation is projected to increase 4.7 million. The report anticipates minorities will comprise the majority of growth in both owner and renter household formation, with Hispanics encompassing a significant share—an estimate potentially stunted, however, by future policy pertaining to immigration, as well as limited mortgage credit accessibility. Another factor influencing household formation involves generational shifts. The report projects baby boomer households to increase 11.3 million between 2015 and 2025, and millennial households to increase 2.6 million. The report's researchers call for the cooperation of government at all levels to ensure homeownership is universally attainable. State and local government have a central role to play in defining specific community needs, crafting policies, and marshaling resources to support housing solutions," the report states, "but only the federal government can provide funding at the scale necessary to make meaningful progress to the nation's stated goal of a decent home in a suitable living environment for all. "Meeting this growing and diverse [housing] demand," McCue says, "will require concerted efforts by the public, private and nonprofit sectors to explain the range of housing options available." Summer allows us to slow down, stop and smell the roses and take a break from the rapid pace we usually run during the rest of the year. But before you hit the hammock and fire up the grill, take a look around your home. There are a few important maintenance checks that need to be made first. Doors and windows. Make sure locks are functioning properly and check your window screens for any holes. Go outside and check window and door frames for any evidence of damage. Electrical outlets and cords. Look for any fire hazards such as frayed wires or ill-fitting plugs. The plumbing. Look for leaks or problems with the float valve in your toilet and check all of its pipe connections. This is also a good time to check washing machine hoses, replacing any that show signs of wear and tear. The furnace. Clean or replace your furnace filter, your dryer vent and the space under your dryer, all of which can present fire hazards. Outdoor wooden structures. The wet weather of winter and spring can take a toll on steps, decks and playground equipment, so look carefully for rot, deterioration and protruding nails. The roof. While there may not be any visible damage to your roof, it’s a good idea to have a professional inspector check for any potential leaks. The perimeter. Take a stroll around your entire home and look closely for any other signs of damage, especially to gutters, shingles, trees and the foundation. Now that you know your home is safe and sound, head over to that lounge chair and start soaking in the summer. Contact me today for more real estate tips and information. Freddie Mac has released the results of its Primary Mortgage Market Survey® (PMMS®), showing the 30-year fixed mortgage rate dropping for the fourth consecutive week and hitting its lowest level in nearly seven months. The 30-year fixed-rate mortgage (FRM) averaged 3.89 percent with an average 0.5 point for the week ending June 8, 2017, down from last week when it averaged 3.94 percent. A year ago at this time, the 30-year FRM averaged 3.60 percent. The 15-year FRM this week averaged 3.16 percent with an average 0.5 point, down from last week when it averaged 3.19 percent. A year ago at this time, the 15-year FRM averaged 2.87 percent. The 5-year Treasury-indexed hybrid adjustable-rate mortgage (ARM) averaged 3.11 percent this week with an average 0.5 point, the same as last week. A year ago at this time, the 5-year ARM averaged 2.82 percent. Average commitment rates should be reported along with average fees and points to reflect the total upfront cost of obtaining the mortgage. Borrowers may still pay closing costs which are not included in the survey. "The 10-year Treasury yield fell 3 basis points this week," says Sean Becketti, chief economist, Freddie Mac. "The 30-year mortgage rate moved in tandem with Treasury yields, falling 5 basis points to 3.89 percent. Mixed economic data and increasing uncertainty are continuing to push rates to the lowest levels in nearly seven months." For more information, visit FreddieMac.com. Home values in housing markets the nation over continue to heighten—but while homeowners are cheering the gain in equity, some homebuyers' hopes, especially in large locations, are being hosed down. "Homes have gotten so expensive in many major cities that even with low mortgage rates, monthly costs for homes that are currently for sale are starting to be unaffordable," says Dr. Svenja Gudell, chief economist at Zillow. "Down payments are a top concern for today's homebuyers, but the reality is that monthly costs are becoming unaffordable, as well." A recent analysis from Zillow reveals homebuyers in over half of the nation's 35 largest housing markets will need more of their income to afford mortgage payments on a median-valued home than the historic spend. Buyers in Los Angeles, Calif., will need the most: 46.8 percent of their income, up sharply from the 35.2 percent needed in the years prior to the collapse. 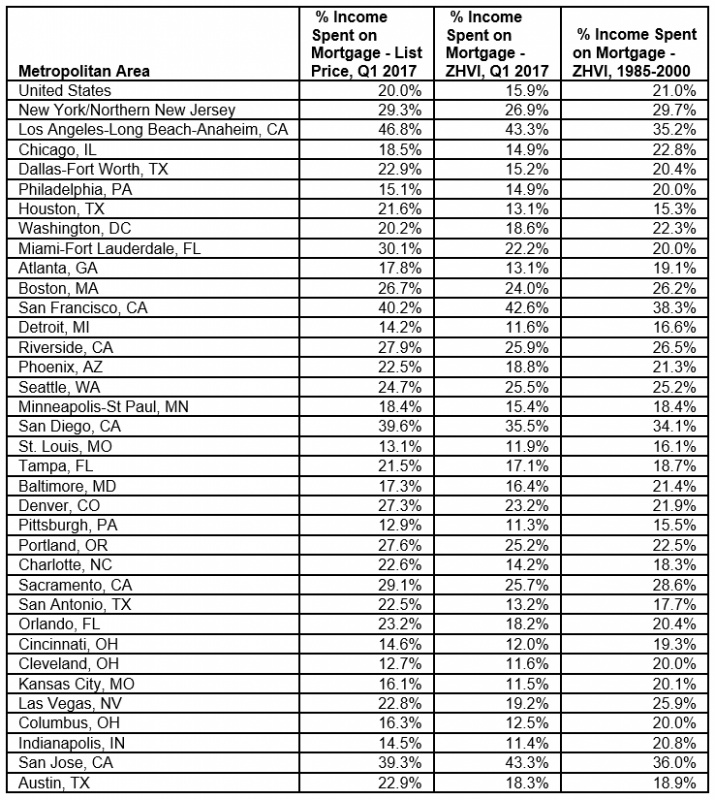 Buyers in San Francisco, Calif., San Diego, Calif., and San Jose, Calif., will also need to allocate a considerable portion of their income to a mortgage, ranging from roughly 39-40 percent. Affordability constraints will tighten, according to Gudell, so long as supply shortages hold. "Low inventory is pushing sticker prices higher, and when mortgage rates start to rise, monthly payments will be driven further into unaffordable territory," Gudell says. Despite steadily improving local job markets and historically low mortgage rates, the U.S. homeownership rate is stuck near a 50-year low because of a perverse mix of affordability challenges, student loan debt, tight credit conditions and housing supply shortages. That’s according to findings of a new white paper titled, “Hurdles to Homeownership: Understanding the Barriers” released Friday in recognition of National Homeownership Month at the National Association of Realtors® Sustainable Homeownership Conference at University of California, Berkeley. Led by a group of prominent experts, including NAR 2017 President William E. Brown, NAR Chief Economist Lawrence Yun and Berkeley Hass Real Estate Group Chair Ken Rosen, today’s conference addresses the dip and idleness in the homeownership rate, its drag on the economy and what can be done to ensure more creditworthy households have the opportunity to buy a home. “The decline and stagnation in the homeownership rate is a trend that’s pointing in the wrong direction, and must be reversed given the many benefits of homeownership to individuals, communities and the nation’s economy,” said Brown, a Realtor® from Alamo, California. “Those who are financially capable and willing to assume the responsibilities of owning a home should have the opportunity to pursue that dream.” One of Brown’s main objectives as president of NAR is identifying ways to boost the homeownership rate in a safe and responsible way. Post-foreclosure stress disorder: There are long-lasting psychological changes in financial decision-making, including housing tenure choice, for the 9 million homeowners who experienced foreclosure, the 8.7 million people who lost their jobs, and some young adults who witnessed the hardships of their family and friends. While most Americans still have positive feelings about homeownership, targeted programs and workshops about financial literacy and mortgage debt could help return-buyers and those who may have negative biases about owning. Mortgage availability: Credit standards have not normalized following the Great Recession. Borrowers with good-to-excellent credit scores are not getting approved at the rate they were in 2003, prior to the period of excessively lax lending standards. Safely restoring lending requirements to accessible standards is key to helping creditworthy households purchase homes. The growing burden of student loan debt: Young households are repaying an increasing level of student loan debt that makes it extremely difficult to save for a down payment, qualify for a mortgage and afford a mortgage payment, especially in areas with high rents and home prices. As NAR found in a survey released last year, student loan debt is delaying purchases from millennials and over half expect to be delayed by at least five years. Policy changes need to be enacted that address soaring tuition costs and make repayment less burdensome. Single-family housing affordability: Lack of inventory, higher rents and home prices, difficulty saving for a down payment and investors weighing on supply levels by scooping up single-family homes have all lead to many markets experiencing decaying affordability conditions. Unless these challenges subside, RCG forecasts that affordability will fall by an average of nearly 9 percentage points across all 75 major markets between 2016 and 2019, with approximately 5 million fewer households able to afford the local median-priced home by 2019. Declining affordability needs to be addressed with policies enacted that ensure creditworthy young households and minority groups have the opportunity to own a home. Fewer property lots at higher prices, difficulty finding skilled labor and higher construction costs are among the reasons cited by RCG for why housing starts are not ramping up to meet the growing demand for new supply. A concentrated effort to combat these obstacles is needed to increase building, alleviate supply shortages and preserve affordability for prospective buyers. Today’s homeownership event in Berkeley brings together leading housing economists, policy experts, real estate practitioners and public officials to discuss current market conditions, housing policy, improving access to credit, affordable housing options and inequality. Along with Brown, Yun and Rosen, the notable list of speakers are: Katherine Baker, California State Assembly, 16th district; Matt Regan, senior vice president of public policy, Bay Area Council; Chuck Reed, former San Jose Mayor and special counsel, Hopkins & Carley; David Bank, senior vice president, Rosen Consulting Group; and Jim Gaines, chief economist, Texas A&M University Real Estate Center. Additional speakers are Joel Singer, CEO and state secretary, California Association of Realtors®; Nancy Wallace, co-chair, Fisher Center for Real Estate & Urban Economics and professor, UC Berkeley Haas School of Business; Laurie Goodman, co-director, Housing Finance Policy Center, Urban Institute; Carol Galante, I. Donald Terner Distinguished Professor of Affordable Housing and Urban Policy; faculty director, Terner Center for Housing Innovation; Co-Chair of Fisher Center for Real Estate and Urban Economics; and former FHA Commissioner; John C. Weicher, director, Center for Housing and Financial Markets at the Hudson Institute, and former FHA Commissioner. “Hurdles to Homeownership: Understanding the Barriers” is the second of three papers scheduled for release in 2017 by RCG. Among the findings of the first white paper, “Homeownership in Crisis: Where Are We Now?,” released earlier this year, RCG estimated that more than $300 billion would have been added to the economy in 2016, representing a 1.8 percent bump to GDP, if homebuilding returned to a more normalized level consistent with the historical trend. The third paper – published later this year – will highlight a series of creative policy ideas to promote safe, affordable and sustainable homeownership opportunities. For more information visit https://www.nar.realtor/.